There are many clichés that exist about taking risks. For Disney’s latest mega-attraction, the one that resonates loudest is if you’re going to take a risk, make it a big and bold one. Indeed, when it came to expanding their Animal Kingdom Park at Walt Disney World, Disney bet big on the Avatar franchise—a huge box office hit but one with few memorable characters despite raking in multi-billions in ticket sales. While many may have been skeptical (including this writer), Disney’s gamble ended up being a straight flush for the House of Mouse. 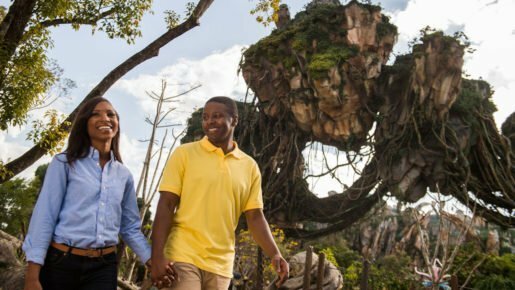 In this issue of The Large Park Report, we explore how Disney leaders, along with the Avatar creative team, executed a near flawless new park experience on almost all levels. That’s a question that many amusement commentators have speculated about both publicly and privately. While Avatar was a massive box office success, it lacked the name brand characters that many movie-goers associate with their favorite flicks. The film certainly had lush settings and famously blue aliens but the names of the key characters are generally not well-remembered. And, even those that could be remembered were somewhat hampered by the fact that Avatar creator James Cameron opted to develop an entire new (fictional) language that included Na’vi (the blue aliens) names like Beyda’amo, Neytiri, and Tsu’tey—hardly the easy to speak (and embrace) names that Pixar likes to create. This started Avatar off at a disadvantage when it came to theming a new park addition where guests immediately recognize and engage with their favorite characters. Avatar-land wouldn’t be able to count on kids wanting to meet Woody, Elsa, or Skywalker and friends. Instead, it would need to create an amusement environment in which guests were immersed so deeply that they would forget they didn’t know a single Na’vi name. For the Animal Kingdom’s new Pandora – The World of Avatar, Disney succeeded in spades. Here’s how. From the moment you walk into the main entrance area of Pandora, every detail seems to transport you to another place (this is not so much the case with the land’s secondary entrance—one of this writer’s few quibbles with the area). The transition from the theming of the main Animal Kingdom hub into Pandora actually begins discreetly with a few transition elements as you cross a bridge over Discovery River into your adventure. The theming then builds as you get further away from the hub theming as every detail seems to include unique elements. Lighting. Foliage. Signage. Even the texture of the walkway. This level of detail is critical when you consider that Disney is attempting to transport guests to an entirely new solar system (known as Alpha-Centauri) in what amounts to the distance of a half a football field away from the hustle and bustle of the main traffic center at Animal Kingdom. In collaboration with James Cameron’s Lightstorm Entertainment, Disney has been working on Pandora since 2012. What does a half-decade’s worth of work get the guest? For starters, the main attractions are the two rides in Pandora: Na’vi River Journey and Avatar Flight of Passage. The River Journey is a dark ride that meanders calmly through a mystical river. While the boat ride mechanism appears pretty standard, the scenes you float through do not. These scenes rely on audio-animatronics like many other floating dark rides but also rely heavily on impressive new projection technology. Indeed, other than a massive audio-animatronic at the ride’s culmination (probably the largest and smoothest-moving AA we’ve seen to date) the projection technology is actually the most impressive special effect. This writer rode the attraction several times during media previews just to see these projections again and again. They certainly have the “how did they do that?” sense to them. Avatar Flight of Passage is clearly the lead attraction at Pandora though. Best described as merging Soarin’s big screen simulator technology into a personalized ride vehicle, Flight of Passage is a fantastic upgrade to this technology. The ride itself includes visual experiences along with a gentle splash of water here and there as you fly through Pandoran vignettes including a tsunami unlike any other. While the ride mechanism and scenes are extremely impressive, it’s the ride queue that steals the show. Starting outside in the main Pandora area, the queue line provides guests with the best views of the entire Avatar land (though take note: the queue does include a noticeable vertical grade you must walk up to get this view). From there, the queue winds inside a variety of scenes with the crescendo being a faux lab on Pandora with set pieces that are so good we saw guests let others pass them in line while they explored the details. Whether intended or not, the amazing detail of the Flight of Passage queue has created the rarest of theme park experiences: line cutting with permission from those in front of you! As with the River Journey, Flight of Passage includes massive amounts of projection and other special effects. Two key questions will be how durable are these technologies and how much Disney has budgeted to keep the attractions and their technology fully functional in the tough Central Florida climate. The two Pandora rides make the Avatar experience a very special one for guests. Disney and Lightstorm did not stop there though. Both the merchandise and the food/beverage operations include customized Pandoran features that evoke the level of detail found in the Wizarding Worlds at Universal Studios. In comparison to Universal’s Harry Potter-land, this presented Disney with a challenge though. The food and beverage elements in the Potter movies were well-loved but the same does not hold true for Avatar. In particular, Harry Potter fans flocked to Universal to try the real-world version of Butterbeer that was made famous in the movies. For Avatar, there wasn’t a beverage or food item that generated similar excitement. That meant that Disney had to create new food and beverage items that connected with the Pandora world but were developed from scratch. After touring the food and beverage venues, it’s clear that Disney attempted to embed these offerings into the backstory of Avatar. The food at Satu’li Canteen is presented in interesting ways but still approachable. The beverages at Pongu Pongu are unique but not too exotic. All in all, it’s a well-done line-up that makes a meaningful effort to incorporate the dining experience into the storyline rather than just decorate the venues with Pandora-ish items. Disney faced a similar challenge in the merchandising realm. Unlike the Wizarding World which had built-in demand for sorcerer’s caps and magic wands from the movies, the Avatar film didn’t yield iconic items that the public would want to buy as merchandise. Like the food and beverage situation, Disney adjusted to this by creating new interactive merchandise options that embraced the Avatar folklore while still appealing to guests of different ages. Known as Windtraders, the Pandora merchandise shop includes over 200 custom made items exclusive to the new land. Here guests can customize Na’vi jewelry and totems as well as purchase Banshees (the flying characters from the film) that are also customizable. While Disney could hardly compete with the popularity of the customized Ollivander’s wands at Wizarding World, the Pandora merchandise items certainly are eye-catching in their design. Still though, selling Pandora merchandise will probably be Disney’s biggest challenge for the new area. Their best bet will be that guests receive the two attractions so well that they want to bring the experience home with richly and colorfully designed souvenirs. In total, Pandora—The World of Avatar offers exciting new adaptations of theme park technology combined with new elements (especially the projection technology) that produce an experience which exceeds any new theme park addition in recent decades, including the Wizarding World attractions. 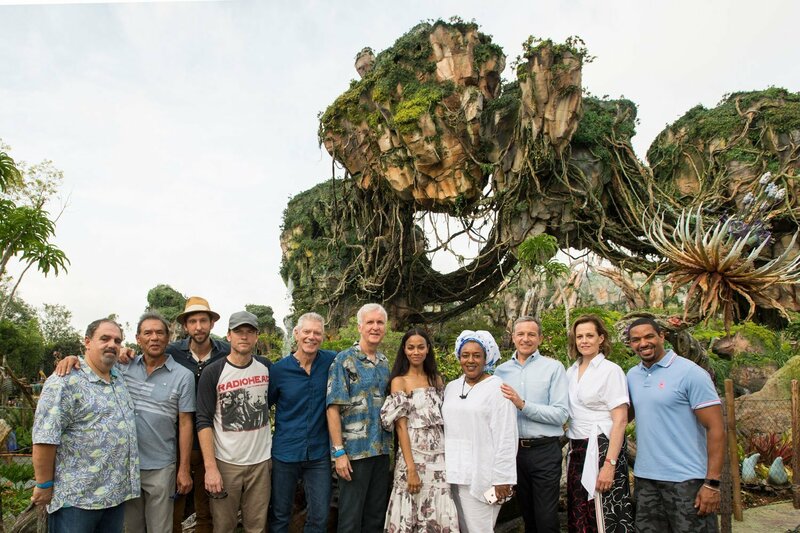 Indeed, it is the unprecedented investment in the overall thematic elements of the entire land—from sights to sounds to touches and more—that convinced this original skeptic that Pandora is the new benchmark for a theme park experience.